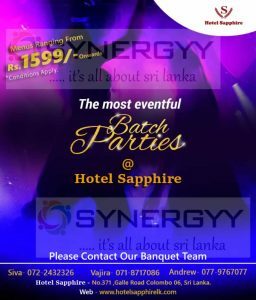 Heritage hotel Anuradhapura is one of the best hotel located in Anuradhapura and offer range of services in tourism and hospitalities in north central province. Hotel Sapphire is one of the good hotel located on Colombo 6 with an ample vehicle parking facilities. The Hotel Sapphire brought you a Banqute halls for your fun parties, Batch Parties and all your family events with an affordable menu prices starting from Rs. 1,599/-. 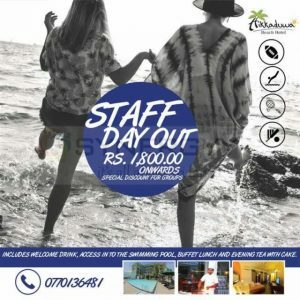 Hikkaduwa Beach Hotel brought you a special promotion for your office tour for this season, if your department staffs start thinking of day out; here is an excellent promotion from Hikkaduwa Beach Hotel. Spend your day out at famous Hikkaduwa Beach and enjoy the Hikkaduwa Beach Hotel properties at ha nominal price of Rs. 1,800/- per person. 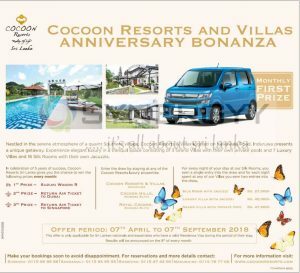 Nestled in the serene atmosphere of a quaint Southern village, Cocoon Resorts & Villas located on Kaikawala Road, Induruwa presents a unique getaway. Experience elegant luxury in a tranquil space consisting of 3 Grand Villas with their own private pools and 7 Luxury Villas and 16 Silk Rooms with their own Jacuzzis. For every night of your stay at our Silk Rooms, you earn a single entry into the draw and for each night spent at any of our Villas you earn two entries into the draw. 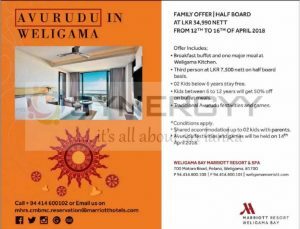 Celebrate your avurudu in Weligama Marriott Resort from 12th to 16th April 2018 at special Family Offer/ Half Board Basis for Rs. 34,990/- Only. Breakfast buffet and one major meal at Weligama Kitchen. Third person at LKR 7,500 nett on half board basis. 02 Kids below 6 years stay free. 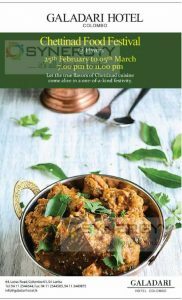 Kids between 6 to 12 years will get 50% off on buffet meals. Traditional Avurudu festivities and games. Shared accommodation up to 02 kids with parents. Avurudu festivities and games will be held on 14th April 2018. Some people say you only fall in love once, but I fall in love every time I see you, enjoy your Valentine Day moment at Hilton Colombo on this year 2018. 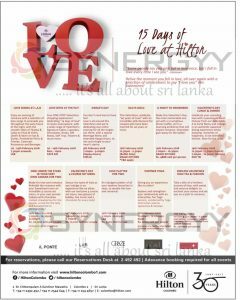 Hilton Colombo Brought you range of Valentine Day promotions as below, enjoy your day with your loves one. Tourist arrivals to Sri Lanka reached an all-time high of 2,116,407 in 2017 according to the latest data released by the Sri Lanka Tourism Development Authority. The arrival figure for 2017 represents a 3.2 growth or 65,595 more arrivals over the preceding year when the figure crossed the 2 million mark for the first time. The higher number of arrivals has been achieved despite serious set-backs to the tourism industry right throughout 2017. The first setback was the partial closure of the country’s main airport from January to April and then southern half of the country experienced devastating floods that cut off access to many resort areas resulting in adverse international media publicity that had an impact on forward booking. Further flooding and a severe drought in the central and northern parts of the country in the latter part of the year added to the climatic woes suffered by the tourism industry during the year which according to industry sources impacted forward bookings. According to SLTDA data, arrivals in December grew from 224,791 in 2016 to 244,536 in 2017 reflecting an 8.8 growth rate which augurs well for the winter season ahead. India continued to be the top source market with 384,628 arrivals (up 7.8%) followed by China with 268,952 (down 1%) and UK 201,879 (up 7.3%). Of the total number of arrivals 2,085,272 reached the country via B1A in Katunayake, 5,491 via MRIA in Mattala, 10,569, via Colombo Harbour, 14,099 via Galle Harbour and 976 via other ports according to statistics from the Department of Immigration and Emigrations. 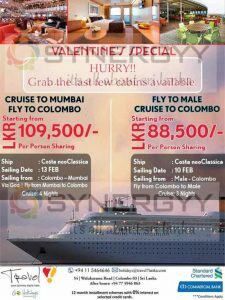 Go Holiday brought you a special promotion for spending this year valentine’s day at Costa Neo Classica Cruise service Male Colombo and Colombo Mumbai. 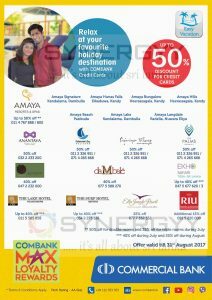 Take a flight to Male and Cruise tour back to Colombo. 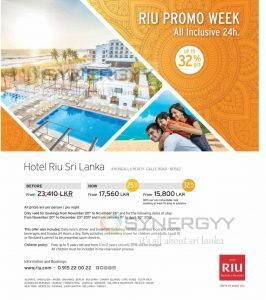 Hotel RIU Sri Lanka, Ahungalla Beach brought you a special price for 24hours stay as low as Rs. 15,800/-per person / per night. Stay from November 20th to December 23rd 2017 and from January 9th to April 30th 2018. This offer also includes: Daily lunch, dinner and breakfast, including minibar, unlimited local and imported beverages and Snacks 24 Hours a day. Daily activities and evening shows for children and adults. Local ID or Resident’s permit to be presented upon check-in. Children policy: Free up to 5 years old and from 6 to 12 years old only 25% will be charged. All children must be included in the reservation process. Formally known as Portofino Resort, Ranna 212 is a tropical paradise that caters to holiday makers and beach lovers. Located on the sandy shores of Rekawa, this 55 room luxury hotel boasts 50 deluxe rooms and five suites which are stylish, spacious and equipped with modem amenities. Each room includes air-conditioning, WIFI, private balconies, LCD TVs, mini bars and a comfortable king or twin sized beds. No matter whether you are on pilgrimage, holiday or business, the Lake House Lodge in the City of God Skanda is your ideal place to stay for a few days with your whole family. Inviting and affordably priced (rates start from just Rs. 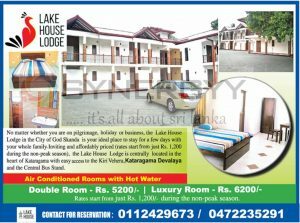 1,200 during the non-peak season), the Lake House Lodge is centrally located in the heart of Kataragama with easy access to the Kiri Vehera,Kataragama Devalaya and the Central Bus Stand. Rates start from just Rs. 1,200/- during the non-peak season. Lake House Kataragama lodge one of the clean property located in Kataragame own by Lake House available for day rent to the travellers. You can book your Double Room for Rs. 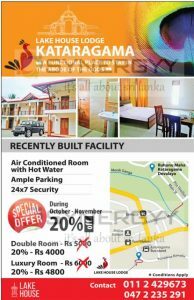 4,000/- and Luxury room for Rs. 4,800/- after 20% off on October & November 2017. 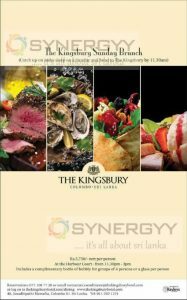 The Kingsbury Hotel announces a special price for their The Kingsbury sunday brunch for Rs. 3,750/- nett per person. 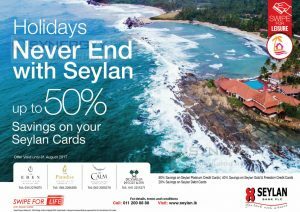 Lantern Beach Collection, Mirissa announces a special discount upto 40% on Full Board and Half Board stay for Sri Lankan. 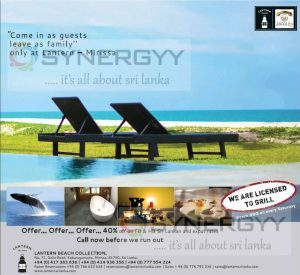 Lantern Beach Collection is the one of the hotel licensed to grill at beach side at mirissa and if you visit on saturday you should try beach BBQ at Lantern Beach Collection. 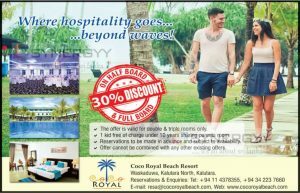 Royal Beach Resort Waskaduwa announces a special promotional saving of 30% for half board and full board. 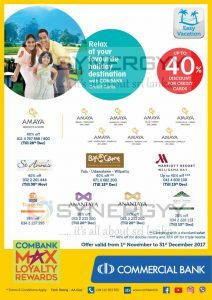 The offer is valid for double & triple rooms only. 1 Kid free of charge under 10 years sharing parents room. Reservations to be made in advance and subject to availability. Offer cannot be combined with any other existing offers. 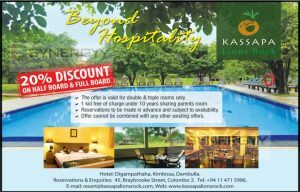 Kassapa Lions Rock announces a special promotion of 20% off on Half Board and Full Board. 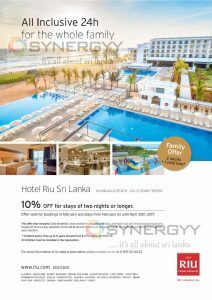 The offer is valid for double & triple rooms only. 1 kid free of charge under 10 years sharing parents room and Reservations to be made in advance and subject to availability. 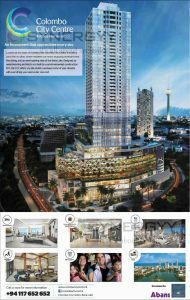 Marino Mall is an upcoming shopping mall in Colombo 3 with entrance from Galle Road and Marine drive. 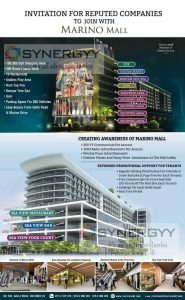 Marino Mall comes with 150,000 square feet shopping areas and 300 luxury room hotel and 10 Restaurants. And Marino Mall get facility of Kiddies Play Area, Root Top Pub, Banyan Tree Spa, Gym, Parking Space For 300 Vehicles, Easy Access From Galle Road & Marine Drive. This offer also includes: Daily breakfast, lunch and dinner, including minibar, unlimited local and imported beverages and Snacks 24 Hours a day. Alcoholic drinks will be served from 10 am to 2 am. Local ID or Resident’s permit to be presented upon check-in. * Children policy: Free up to 5 years old and from 6 to 12 years old 50% off. All children must be included in the reservation. 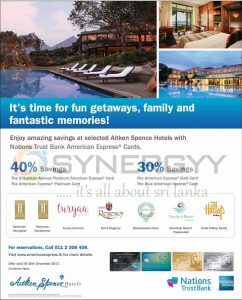 A five star space has opened its doors in die most sought after location in Colombo. Jetwing Colombo Seven, a hotel brimming with serenity will make anything possible to ensure your stay is a fusion of contemporary elegance and absolute luxury. Flanked by tree-lined streets and the mansions of the wealthy, this abode is as exclusive as its surroundings. 70 plush rooms and 28 serviced apartments’ that include a magnificent rooftop infinity pool, eclectic restobar, fusion restaurant, modern gym, therapeutic spa and conference facilities, make this hotel a true urban refuge. There’s only one Jetwing Colombo Seven and we invite you to come experience this all new space. are you looking forward a special promotional of hotel or villa for your get together or meet up, here is an special Introductory offer from Villa Mahakanda. Villa Mahakanda is an ideal Hideaway in Kandy, offering 4 Course meals and Star Class Rooms in Blissful Surroundings. Only a 10 minute drive from the Galaha intersection & through one of Asia’s largest and most beautiful universities in Peradeniya.